How Much Sediment Is In Lake Powell? Thirteen years following the completion of Hoover Dam in 1935 the first sediment study showed that 1.426 million acre feet (MAF) of fine sediment (clay, silt and sand) had accumulated in Lake Mead of which the majority had passed Lees Ferry gaging station. Few quantitative sedimentologic studies followed but one study estimated 54-60 million metric tons per year had been transported through Glen Canyon to Lees Ferry between 1949 and 1962 of which 40% was sand. Even though dams were built upstream as part of the CRSP in the early 1960s, a substantial amount of fine sediments continued to be transported into Glen Canyon primarily by the Colorado River and the San Juan River. For various reasons since Glen Canyon Dam was completed detailed bathymetric studies of Lake Powell have only been occasionally conducted, but hardly in any systematic and thorough way. Those who have boated Cataract Canyon or the San Juan River certainly have experienced the muddy, silty waters and for those who boated these rivers in the pre-dam or pre-full pool periods (pre 1963 to 1984) and continued boating into the 21st century have witnessed some major sediment accumulations that have buried the former steep river gradients in the two river canyons. The rivers simply lost their capacities to carry the mass of suspended and bed load of sediments. The huge volume of sediments transported by these rivers quickly lowered gradients from many feet per mile to inches per mile and produced steadily advancing (prograding) deltas into the reservoir ~40 miles on the Colorado River and even more on the San Juan. As the reservoir level continued to drop it left untold cubic miles of loosely consolidated sediments lining the incised river beds (Figure 1, below). 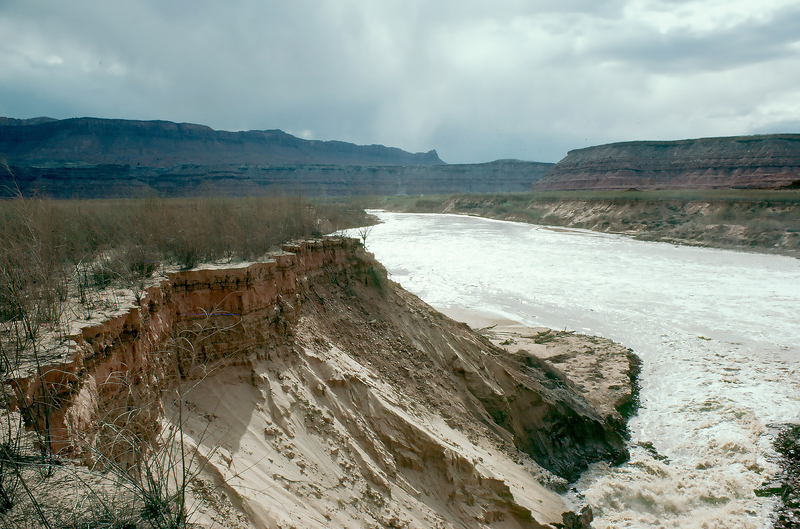 But even through these drought years, the incised river channels have continued to carry large loads of fine sediments into Powell reservoir, plus millions of acre feet of high & dry stranded sediment were remobilized into the prograding river deltas. Although the average gradient of the Colorado River between the elevations of 3700 ft to 3550 ft is about 2.5 times greater than the San Juan River between the same two elevations, the mean gradient of the lower San Juan in the lake is 25% greater than that of the Colorado (i.e., the original “lower canyon” of the San Juan). Plus, the mouth of the San Juan is only 60 miles above Glen Canyon Dam, while the present day delta front on the Colorado arm below Hite is still some 145 miles above the dam. 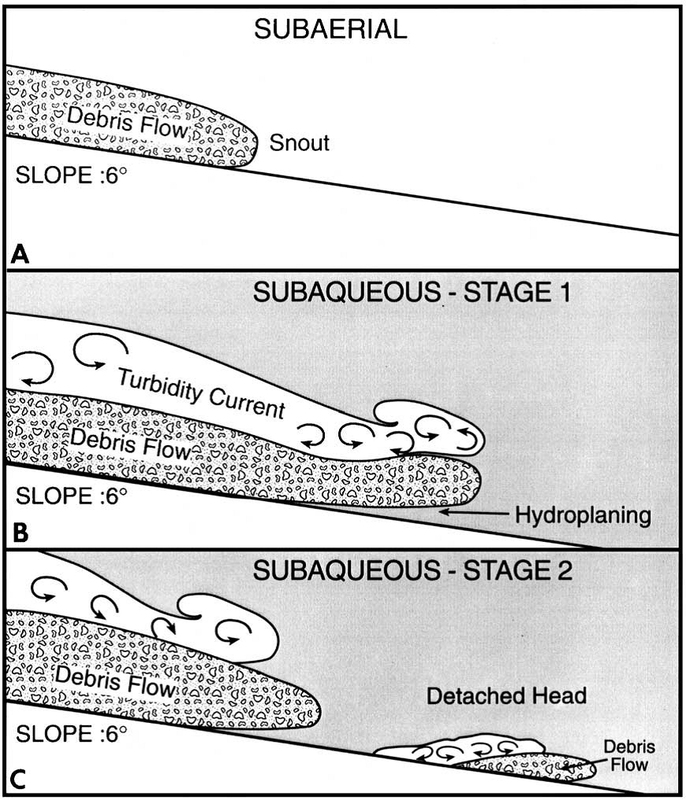 showed that over a period between 1999 and 2005 fine sediments were displaced from the submerged delta fronts (prodeltas) as turbidity currents (subaqueous gravity flows; Figure 3, below) but were limited (blocked) on the Colorado arm. However, on the San Juan arm, the combination of the normal high percentage of suspended load was added to by the exposed unconsolidated lake sediments such that San Juan turbidity flows transported (redistributed) millions of metric tons of fine deltaic sediments to the base of Glen Canyon Dam below the elevation of “dead pool” as early as 2004-05 (SF-2 & SF-3 on Figure 2). 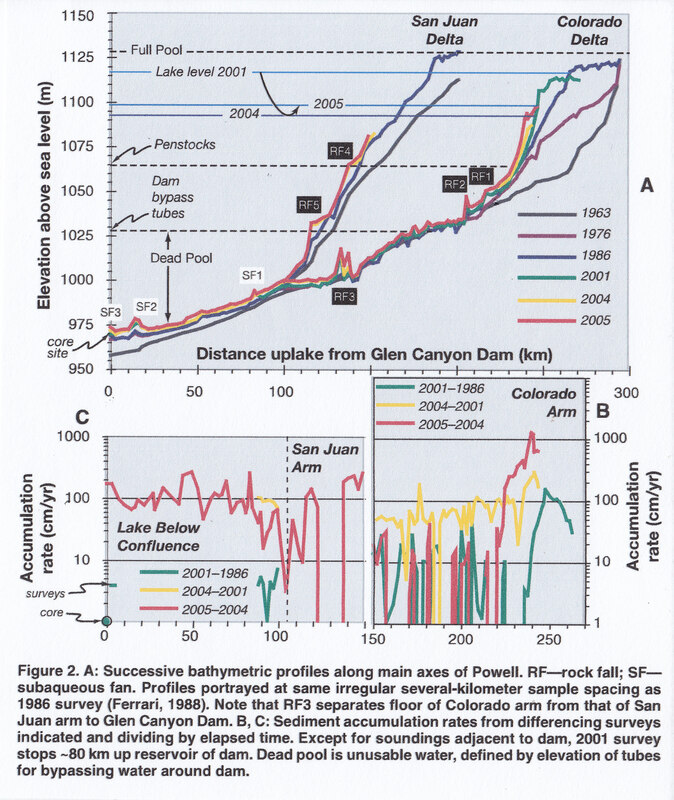 Their study estimated that the fine sediment redistribution represented nearly twenty-two years of river sediment deposited in Lake Powell and was remobilized to the deepest part of the lake in 20% of thetime (Pratson, etal, 2008, p. 846; Figure 2). The Lake Powell website (9/26/2018) indicates that lake level stands at ~3593 ft (1095 m) which is now 107 ft below full pool of 3700 ft above sea level. But full pool elevation is misleading in thinking there could be 27 MAF of water in the reservoir since that volume must include millions of metric tons of sediment as well as dead pool volumes of water, which is more than likely being displaced by turbidite transported sediments (see Schmidt, 2018, CRRG “Fill Mead First” proposal). At the rate of drawdown on Powell reservoir, and the continued inflow of sediments, the call to drain Lake Powell will soon be a moot point and the efforts can switch from draining a dead pool to just simply removing the concrete barrier, and John Wesley Powell’s name can be properly cleansed and reclaimed by true conservationists. Shanmugan, G., 2001, Ten turbidite myths: Earth Science Reviews 58 (2002), p. 311-341.